Iron Age pottery scatters occur in four distinct areas, with five other isolated finds (Figure 3.10). On completion of the project a field, No 2890, outside the parish at the corner of the A52 and Granby Lane was walked in order to investigate the possible eastward extension of Iron Age and Romano-British activity that had been established in field 2491 on the west of Granby Lane and to test the idea that the settlement at Whatton prison examined by Platt (2005) extended southwards. The widest spread of Iron Age sherds is around Margidunum. The finds here, including one Scored Ware sherd, are more densely concentrated near the roundabout in fields 9912, 0414 and the northern end of 0412. Three other sherds were found up to 700 metres away from the roundabout. One of the difficulties in interpreting the Iron Age sherds distribution is that a number of Anglo-Saxon sherds were identified in the same area. These are superficially similar to the Iron Age pottery and one sherd was in fact claimed by two specialists as being Iron Age and Anglo-Saxon! Field walking outside the parish by Trent & Peak Archaeology (Appleton et al. 2003 and Kinsley, 2004) showed higher densities of handmade pottery sherds on the west of the A46 south of the roundabout and on both sides north of it. Most of these have not been resolved into Anglo-Saxon and Iron Age or 1st century Romano-British. Leary and Baker (2004), in their synthesis of the information held on Margidunum, report on a group of Iron Age sherds from a layer excavated to the south of the town that indicates pre-Roman Iron Age activity of an uncertain character, but go on to suggest that in other parts of the East Midlands Roman towns and villas were often established on or adjacent to established British settlements. The likelihood of there being an Iron Age settlement close to Margidunum when the Romans came here in AD 50-55 is high. The scatter in Bingham parish adjacent to the roundabout might be associated with a field system associated with this settlement. Some of the crop marks visible on air photographs on Parson’s Hill may also indicate Iron Age activity. Field walking in1969 reported in the East Midland Archaeological Bulletin (EMAB, 1977) records finding Scored Ware sherds in the western part of Parson’s Hill. Coleman (1979) was unable to gain access to the area for field walking, but describes the crop marks as probable Iron Age in origin. They extend for 900 metres along the ridge (Figure 3.11). Iron Age sherds, including several of Scored Ware, are found exclusively in association with the western half of the area of crop marks. Most are quartz tempered, but one has a fuel-ash slag temper. Among the sherds are an upright rim of vessel and the shoulder of another. Signs of sooting are present on one, which suggests it is from a cooking pot. Scored Ware is typically middle to late Iron Age. In field 2491 on the eastern parish boundary just south of the A52 eight sherds of Iron Age pottery were found in a linear group spanning nearly the whole length of the field. No evidence has been forthcoming from air photographs of a settlement here. Excavations carried out by Trent & Peak Archaeology on the site of the extension to the prison at Whatton, about 500 metres away, revealed evidence of part of an Iron Age settlement (Platt, 2005). The pottery at Whatton was identified by David Knight as characteristic of the East Midlands Earlier La Tène ceramic tradition, dated currently from the fifth to first centuries BC, and it was suggested that the site was abandoned at some time prior to the beginning of the first century BC. In field 2890, which is outside the Bingham parish immediately to the south of the prison excavation, six Iron Age pottery sherds were collected (Figure 3.12). They were not tightly dated, but one very eroded piece has score marks and another is fuel-ash slag tempered, similar to finds from Parson’s Hill and the prison site. Five of the finds occur in a very tight group near the A52 opposite and close to the prison car park and could represent an extension of the area of activity identified in the prison area by Platt (2005). A single sherd of Roman grey ware was found here. In contrast, the Iron Age sherds in field 2491, some 500 metres away to the west, are closely associated with a large number of Roman finds and may belong to a different settlement or farm. David Knight suggested that these sherds could date from the late Iron Age, possibly from the late 1st C BC to the early/mid 1st C AD. A single sherd of Iron Age pottery was found among a large number of Roman sherds along the western side of this enclosure complex (Figure 3.12). A concentration of five finds was found in field 9278 in the south-west corner of the parish near Lower Brackendale Farm. 400 metres to the south-west crop marks on air photographs show two enclosures side by side with a possible house circle in the centre of the one to the east. 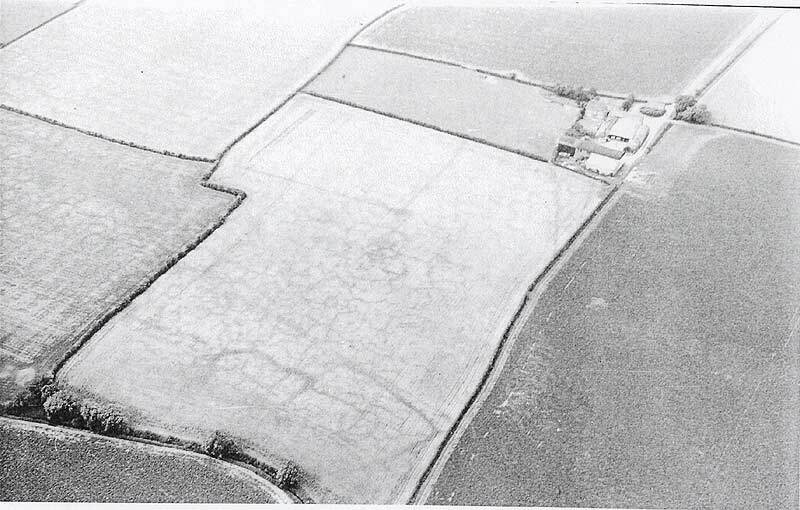 Figure 3.13	Aerial photograph of the SW corner of the parish, near Lower Brackendale Farm showing crop marks. Two irregularly shaped enclosures are evident near the bottom of the picture and there is a suggestion of a circle in the centre of the one on the right. There is also a circular structure in the field to the left, but this is outside the parish and has not been investigated. The rectangular enclosure at the northern end of the field does not correspond with any field boundary present on maps dated 1776 or later and could pre-date open field farming. ©English Heritage. NMR (Jim Pickering Collection). JAP 259/14 SK 6937/ 15 JUL 1970. Some Roman sherds were found here, but no Iron Age material. Alluvium along the water course at the southern boundary of this field conceals the southern part of these enclosures and possibly any evidence of Iron Age activity here. Two finds of Iron Age pottery sherds were made about 250 metres apart in fields to the east of the Lower Brackendale cluster. One of them, number 18876 in field 9981, is of doubtful attribution. The other is in field 0179, which, though isolated, was found within 100 metres of a small cluster of Roman pottery with dated sherds no earlier than late 2nd century. Fields around contain sherds of late 1st to 2nd century wares. Although they are very thinly scattered it does appear that there was activity here in the 1st century and perhaps earlier. Two other finds, in fields1803 and 9890, are isolated occurrences. The one in field 1803 is right on the parish boundary and would need investigating across the boundary to see if it was anything more than an isolated occurrence. Similarly, the find in field 9890 was collected near the A52 and might have been redistributed during road building or be associated with a cluster now destroyed by road building. The evidence from field walking is that there was a long and well-established Iron Age population in the parish prior to the Roman occupation. The main pottery scatters are in four discrete areas, Lower Brackendale, in the vicinity of Margidunum roundabout, Parson’s Hill and Granby Lane, all of which also have Roman pottery. These occurrences are very likely to be indicative of areas of habitation. Outside of them the single occurrences of Iron Age pottery in fields 9890 (close to the A52) and 1803 (close to the parish boundary) could be associated with clusters, not yet found. The most interesting of the single occurrences is at the double-ditched sub-rectangular enclosure in the south of Starnhill Farm, where far more might be expected if the structure was Iron Age in its origin. Riley (1980) suggests that similar double-ditched enclosures in northern Nottinghamshire and south Yorkshire are Iron Age, but in her analysis of the brickwork-plan field systems in north Nottinghamshire Garton (2008) records instances of double-ditched enclosures among the Romano-British farms. Interestingly, the pair of enclosures with a possible house circle seen as crop marks near Lower Brackendale Farm yielded no Iron Age sherds, while the single find in field 0179 is close to a large cluster of Roman pottery. The area under the developed part of Bingham has, so far, yielded evidence of Iron Age occupation only in the excavations on Long Acre behind the Chesterfield Arms. Here, several late Iron Age sherds were found, but Rayner (2006) considers that: “the small number of pre-Roman sherds retrieved from this site suggests a limited presence at the close of the pre-Roman Iron Age.” Gregory (1969) does not mention any Iron Age sherds having been recovered during the building of the Carnarvon Primary School. The best evidence from ceramics for the age of any of the possible settlements outside built-up Bingham comes from the Parson’s Hill assemblage, which contains scored ware, a middle to late Iron Age type of ware. However, the wide spread of Bronze Age tools in the parish, including at Iron Age sites such as Margidunum and Granby Lane suggests that some of the undated sherds might be from early in the Iron Age. Using the distribution of sherds there were four main centres of Iron Age population, but the possibility exists that there may have been as many as nine altogether, including isolated small farms. Whether or not these were occupied concurrently is not known.